Plastic based textile is basically designed to cool the body very efficiently. It works by allowing the body to discharge heat in different ways. The plastic based textile make the wearer feel cooler than if they wore normal clothing. Further, the new clothing could help people to reduce body heat. It reduces the cost of expensive and energy consuming equipments such as air conditioner. Plastic based textile is light in weight, cost effective and comfortable to wear. Further, the manufacturing of plastic based textile is an environmental friendly process which includes the recycling of plastic waste into useable material. Global plastic based textile market is anticipated to witness a robust growth over the forecast period. Various factors that are propelling the growth of plastic based textile market are increasing disposable income of the population and rising adoption of innovative wearable clothing among the young generation. Europe is the second largest plastic based textile market in terms of revenue. Further, Germany and U.K. are the prominent countries in this region that are attributing the growth of plastic based textile market. Moreover, high investment on research and development by the major market players for the plastic based textile is believed to be the dynamic factor behind the growth of plastic based textile market in Europe. Apart from this, Asia-pacific region is projected to witness a robust growth over the forecast period. The growth in this region is aided by China, Japan and others countries. Further, rising per capita income and rising purchasing power of the consumers are believed to bolster the growth of plastic based textile. Plastic based textiles are widely used in summers as they are heat resistant. Further, the demand for these products is anticipated to expand at a higher pace in the countries that have hot climate. Rising adoption of plastic based textile apparels in different sectors such as industrial, military and others are expected to be the dynamic factor behind the growth of plastic based textile market globally by the end of 2024. However, rising demand for plastic based textile sports apparels for long lasting cooling effect is also envisioned to bolster the growth of the market. Moreover, rising disposable income along with changing lifestyle of the consumers will propel the growth of plastic based textile market over the forecast period i.e. 2017-2024. Likely, growing demand for long lasting cooling effect garments by industries in which the workers work under high temperature is also projected to fuel the growth of plastic based textile market. In terms of challenges, high cost of the plastic based textile products is expected to hinder the growth of plastic based textile market. 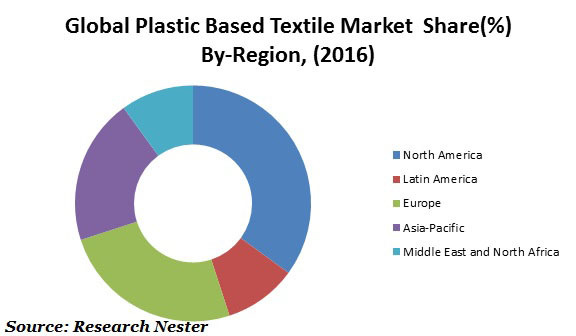 Further, less adoption of costly products in developing nations is expected to hamper the growth of plastic based textile market over the forecast period.